Useful links with tips for the Zune users. Here are some very useful links for the Zune users. I am putting them here so that it will help enhancing your experience with Zune. Ok so let us have a look. Zune was said to have many drawbacks even before people properly explored it and one among the drawbacks that were attached to Zune was the inability to configure it as an external hard drive. But thanks to Dan who maintains the phaleux.com blog, now we know that confuguring your Zune as an external hard drive is not a dream but a reality. 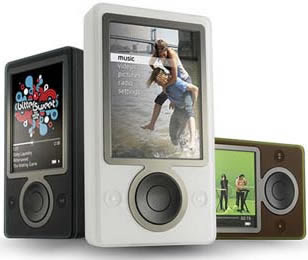 Take a look at it here along with some minor disadvantages of zune. Something that Apple does not offer but which Microsoft offers through Zune is the subscription service. You can use this for playback on multiple PCs. Follow the link below and check it out as to how you can do it. Zune can be integrated with a 12MB sized free software called Feedyourzune which is a full featured RSS reader and Podcast Media Player. Get it here. * Automated download and syncing of Audio and Video Podcasts to your Zune. * Full featured RSS video playback. Supports all video formats. * Discover thousands of amazing Video and Audio Podcasts with the built in Channel Guides from Network2, FireAnt, and more to come! * Open web architecture - supports RSS, BitTorrent, and Blog Permalinks. Ok next up is that Zune can be configured to bypass the Wi-Fi sharing limitations. Go to this page and then check out the Tutorial 3 which is titled "Wi-Fi Transfer of Movies, .Zip files, PDF files etc." Also, check out this page which has great coverage of all Zune news and tips. And if you want to run Zune on Windows XP 64 bit pro check it out at the following link to find out how it can be done. Zune on Windows XP 64 bit pro. Ok guys happy fine zuning..err.. I mean happy fine tuning your Zune.